10 Cloverfield Lane is a taut, well-acted, well-directed, psychological thriller. Marketed as a sort of sequel to Cloverfield, the film is totally different in its set up and execution. It has excellent timing. Building like a slow boil to an ending that will delight most audiences and leave others scratching their heads. The measured reveal of the mysterious plot establishes a palpable tension throughout. There are logistical issues with the setting and the story, but not enough to derail the entertainment value of the film. This is an entirely spoiler free review. 10 Cloverfield Lane begins with Michelle (Mary Elizabeth Winstead) waking up from a car crash. She's in a survival bunker with an injured leg and pants less. She's absolutely terrified and confused. The door to her room opens. She meets Howard (John Goodman). He has a gun belt. He tells her that he's saved her life from an apocalypse. Howard brings her food and crutches. Then introduces her to another occupant of the bunker, Emit (John Gallagher Jr.). Howard's behavior swings wildly from doting to scary aggressive. Michelle does not believe his story about the end of the world. She needs to find out what's really happening here. Emit seems like a nice guy, but he's not exactly sure what happened outside the bunker either. The mystery takes a dark turn when Michelle makes a frightening discovery. Mary Elizabeth Winstead is fantastic in this film. It's her journey. The audience sees events unfold through her eyes. From her opening scenes as a wounded young woman, in her underwear, captive in a strange underground bunker, you feel her terror. But she's not weak or submissive. After the initial shock, Michelle quickly determines to either escape, or find out the truth behind her abduction. Most female characters in these situations have to grow into their resolve. Not her, she's strong and clever from the beginning. Winstead delivers a tour-de-force performance in resiliency. 10 Cloverfield Lane is the directorial debut of Dan Trachtenberg. He gets high marks for a great job. The entire film is set in the bunker. Even though three characters are in a confined space, the film does not feel small. It's exactly the opposite. 10 Cloverfield Lane has a big, cinematic presence. Much like a Hitchcock film, the plot drips out clues until a shocking finale. Trachtenberg's stage direction and editing choices establishes a cat and mouse dynamic between the actors. He truly nails the suspense element, which is the primary driver of the story. There are some major logic gaps. It's difficult to explain these without spoilers, so I'll be generic. First, it's unlikely that three people in a similar situation wouldn't be more forthcoming about the events that led them there. Information is critical, especially if you're to believe these characters could be in that bunker for years. Also, one character in particular does not behave in a realistic way. Again, if you're in a bunker, with death possibly imminent on the outside, it's hard to fathom complacency. I'm not saying everyone would fly off the handle, but action would certainly be taken if there was even a whiff of danger. 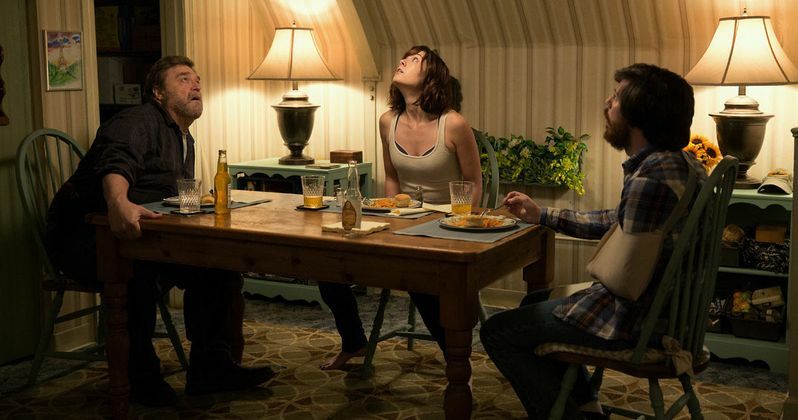 10 Cloverfield Lane is a film that makes less sense the more you think about it. Best to enjoy it as presented without nitpicking, willing suspension of belief is a must here. 10 Cloverfield Lane is a solidly entertaining film. The idea of it being a sequel to Cloverfield is just a marketing scheme. It speaks to the same science fiction and horror audience, but I believe everyone who likes a good scare will enjoy this film. Mary Elizabeth Winstead is the lynchpin. She carries 10 Cloverfield Lane with her superb, claustrophobic performance. I have a feeling we're going to see a barrage of upcoming films set in the 'Clover-verse'. That's a good thing if they're on par with 10 Cloverfield Lane. Can 10 Cloverfield Lane Scare Zootopia Away at the Box Office?